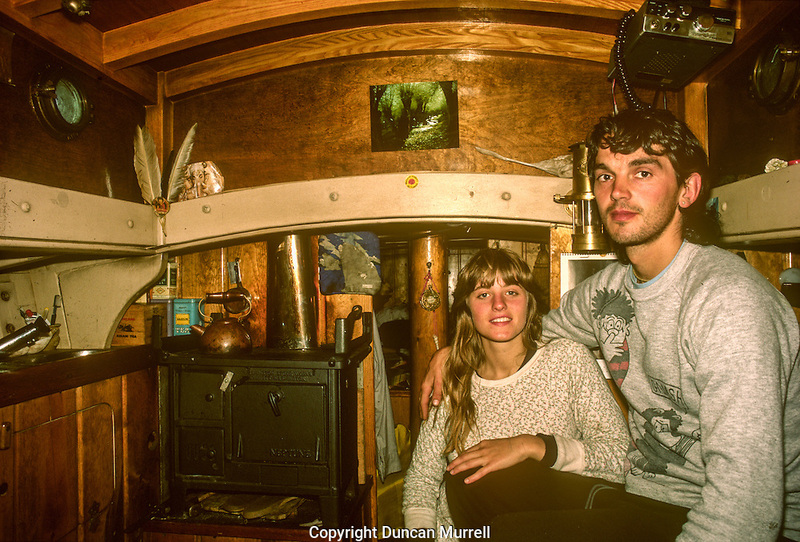 My Alaskan partner at the time, Anne Lee, and me, inside the cabin of our 28 foot wooden sailboat, Avalon in the old harbour at Petersburg, Mitkof Island, Southeast Alaska, USA. We had a small woodstove, for cooking and heating, which required very small pieces of wood. On the starboard side of the boat there was a bunker for wood. Much chopping, splitting and sawing was required to make kindling and a sufficient supply of short lengths of wood to keep the stove going. Because it was such a small space we could get smoked out very quickly. There was a little wooden stool next to the stove, which we referred to as the hot seat. We enjoyed having social gatherings on the boat, and they were very intimate cheek to jowl occasions because of the cramped space. The coach roof was supported by very stout laminated ash beams, which inflicted many painful bruises on my head and on anybody else who was forgetful of the limited overhead clearance. It was my first experience living on a boat and I absolutely loved it.